Is it possible nowadays to make an entertaining ballet combining technology with a classic of literature? 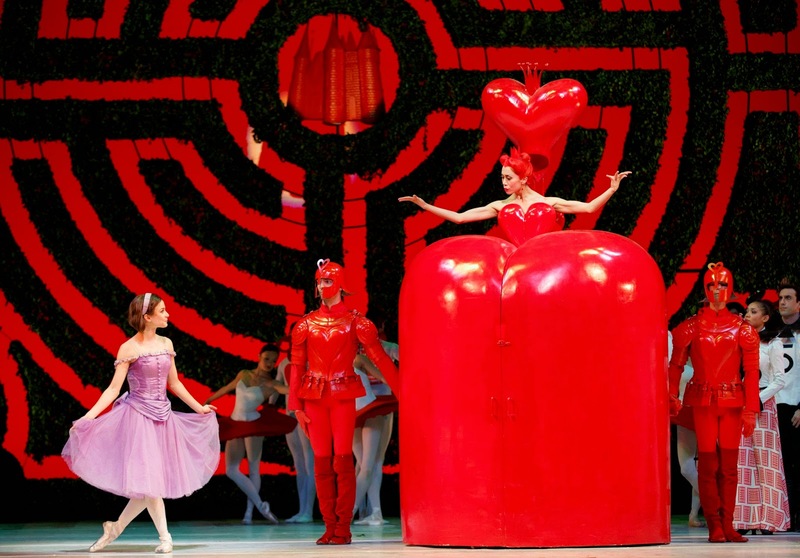 Christopher Wheeldon's Alice's Adventures in Wonderland, danced the National Ballet of Canada and presented by the Joyce Theater at the Koch, offers a resounding yes. 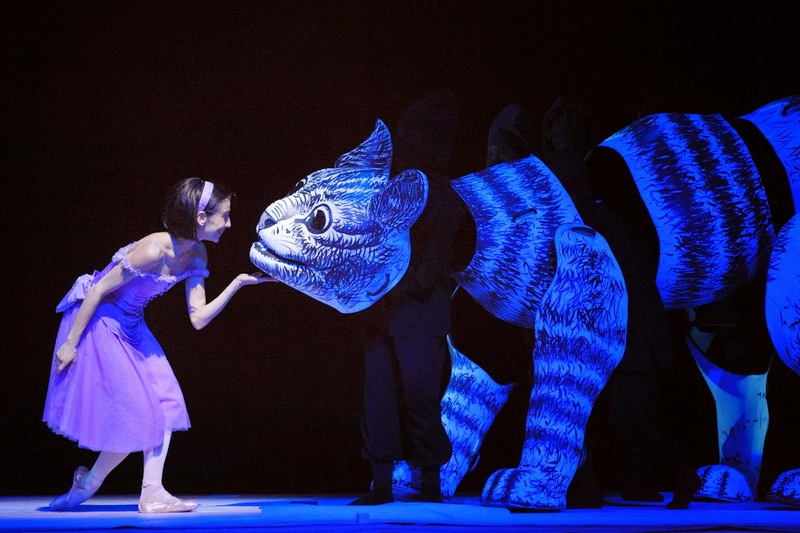 (It originally premiered at the UK's Royal Ballet in 2011, and with CNB that year as well). It falls closer to Broadway-destined spectacles by Matthew Bourne than traditional ballets—not a bad thing. Most enduring popular classical ballets are based on romances either tragic or hard-won, in part to justify the big pas de deux, the beating heart of the genre. Alice has a somewhat stitched-together storyline which fails to tug on the heartstrings like chestnuts such as Giselle or Swan Lake. Here, it's all about the adventure, as the title says, and a thrilling ride it is. The most prominent and surprising elements of the ballet are the sets and costumes by Bob Crowley. It feels as if he pulled every last proverbial rabbit out of his hat, where they've been multiplying for generations. 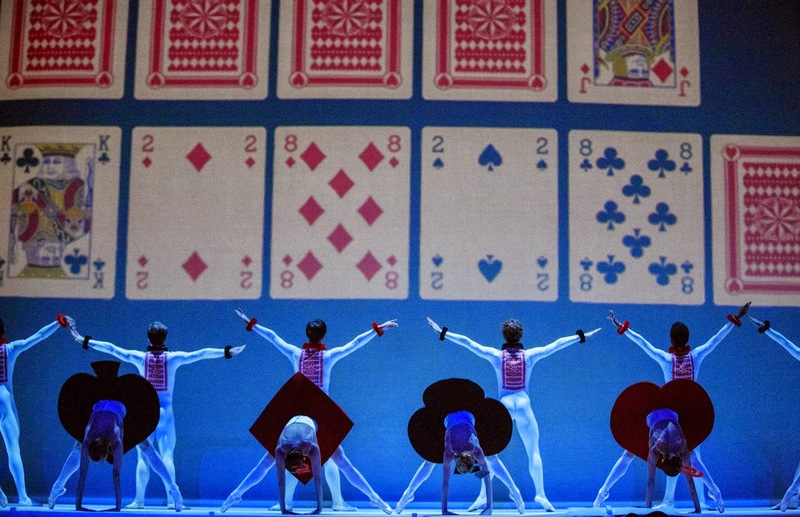 Some effects are plain old stagecraft—puppetry (an enchanting Cheshire Cat, in large and extra-large), admirably built set elements (the Queen's rolling heart-shaped carapace), clever applications of playing card graphics (spade-shaped tutus). Video elements (projection design by Jon Driscoll and Gemma Carrington) are used cleverly, taking us through convincingly dizzying plunges through the rabbit hole, or causing a wall of doors to vibrate hallucinogenically. As in the book, one drawback to talking caterpillars and floating cats is that our protagonist is reduced to a wistful cipher, fading from prominence even as she hardly, heroically even, leaves the stage over the course of roughly two hours (excluding two intermissions). She is called upon, not surprisingly, to react to the various crazy events into which she is coaxed or thrust. Sonia Rodriguez danced the lead role on Wednesday, with Naoya Ebe as her suitor, Jack/Knave. The flamboyant role of Mother/Queen went to Svetlana Lunkina, who landed at the NBC after departing the Bolshoi last year—threatened in the wake of artistic director Sergei Filin being attacked with acid. This real-life drama would be hard to match, but the Queen's eye-popping costume and favorite gesture (slashed throat) did just that. Lunkina switched from preening to bloodthirsty in a split second. Juicy signature phrases went to the Rabbit/Lewis Carroll (Robert Stephen) wearing Lennonesque round pink specs and twitching neurotically when not leaping about, the Fish and Frog Footmen (Dylan Tedaldi and Francesco Gabriele Frola) slithering and waddling with charm, and Raja/Caterpillar (James Harrison), slinking on his stomach, which he also comically rubs in circles. Alice and Jack are given relatively brief duos, in which little chemistry is produced, but Ebe displayed his elegant lines and expressive back, and Rodriguez her solid arabesque when she isn't wriggling through a tiny door or acting shocked, surprised, or delighted. Jody Talbot wrote the pleasing music, often filmic in feel, and recalling Prokofiev and Danny Elfman at moments. It moves the action along pleasantly; perhaps further listenings will let it imprint on the brain. New York City Ballet's orchestra manned the pit, led by David Briskin, music director of the National Ballet of Canada. One niggling criticism about Crowley's costumes, which are on the whole brilliant and witty, is the clashing hues of Alice's lavender frock and Jack's red and white outfits (he is on the lam from Team Queen, whose color is red). Even when their lines are in harmony, they are visually off key. But what lingers in the mind's eye should be the abattoir complete with slaughtered pigs, giant teapots, flowers dancing down the aisles under a flurry of confetti, a massive neon labyrinth, and multiple houses of cards. Catch it if you can.